Apple has released (may not show up quite yet) an iPhone app called iTunes Connect Mobile, which is the mobile version of their iTunes Connect interface for developers that build apps for iOS. 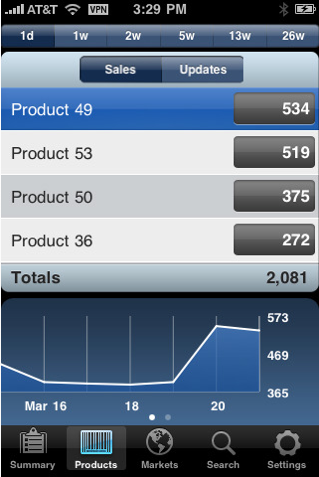 The app shows developers stats on their apps on what looks to be a nice interface. One of the main drivers behind the expansion of the iTunes Connect to the iPhone must be iAds. Apple CEO Steve Jobs mentioned at this week’s WWDC in San Francisco that developers receive iAds payments through iTunes Connect – and we’re guessing other controls will be available as well – so this mobile app is another piece Apple’s attempt to move developers from AdMob to iAd by offering them more tools (although from the screenshot it doesn’t seem to have iAds integrated yet, but of course, iAds won’t launch until July 1). As you can see from the screenshot by TUAW, the app allows developers to see sales data in time increments as well as other useful features including “Markets” and a summary view. We’re not sure how or if this app works with around the different user roles (i.e. admin, legal, finance, and technical) yet.